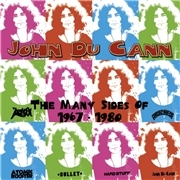 JOHN DU CANN, born John William Cann in 1946, was most famed as lead singer and guitar player of ATOMIC ROOSTER. But there´s more to John than meets the eye. In 1966 he formed THE SONICS, who never took off. An amp tester by daytime, he became part of the music scene in evenings and at night. Eventually his efforts led to THE ATTACK. Signed to Decca by Don Arden, OZZY´S father-in-law, the band split up in 1968, and John formed ANDROMEDA together with Mick Hawksworth and Jack Collins. The Telecaster man soon departed for pastures green in ATOMIC ROOSTER with Carl Palmer and Vincent Crane. As their bass player left the unique bass-less band took shape. A change of direction by Vincent led to John jumping ship again, this time for BULLET/HARD STUFF with Paul Hammond, who had become the new drummer in ATOMIC ROOSTER after Carl Palmer left for ELP, and well-travelled bass man John Gustafson. For some it might be of importance to know that he did two tours as guitarist of THIN LIZZY in between the first era of ATOMIC ROOSTER and BULLET/HARD STUFF. Plagued by bad luck the band came close to becoming big, until a traffic accident had John and Paul bed-ridden in Belgium. After two solo singles, among them the Lee Cooper commercial “Don´t Be a Dummy”, ATOMIC ROOSTER reformed. But the lack of success caused a definitive break-up in 1982. Still hugely influential and much covered by e.g. PARADISE LOST the band never returned. Vincent Crane committed suicide in 1989, after years of depression, Paul Hammond died in 1992 of an accidental overdose, and now, in September 2011 John died of a suspected heart attack. But it´s time to let the music do the talking! The sixties efforts start with THE ATTACK. Their music was sixties orientated and keyboard laden, but still with the touch of John´s unmistakable guitar work. “Magic in the Air” has the mix of flower power and a touch of old age, and the grooves are there in “Mr. Pinnodmy´s Dilemma” has a suggestive feeling which adds to the bands credibility somehow. Off to 1968 and ANDROMEDA. Rock was beginning to shake it´s head, and “Too Old” boosts John´s guitar sound and a really entertaining bass line. Their flirt with classical music, the three-part “Return to Sanity”, is an ambitious nod to Holst´s “The Planet Suite”. You can detect latter day hard rock and metal with symphonic twists here! The feeling of ANDROMEDA is that of a band with a mature and developed sound. Five tracks from the ATOMIC ROOSTER catalogue are included, three from the first age, and two from the second. Of the first three, two are obvious classics in the shape of “Tomorrow Night” and Devil´s Answer”. Those songs appeal to both the rock era addicts and the hard rock fans. The psychedelic tambourine boogie “Night Living” is no doubt included with a smile, John himself compiled this album. It´s nevertheless archetypal of the band, the voice and the Hammond organ both play important parts. Off to the unlucky BULLET/HARD STUFF. The bluesy seventies rock, or swinging 70´s rock and roll must have brought many houses down back then. “Millionaire” and “Jay Time” are examples of the ultimate in 70´s lyrics, as well riffs with 50% super glue in them. The feeling of opportunities sadly lost is legion when listening to these tracks. In the late seventies John apparently worried about releasing his singles “She´s My Woman” and “Don´t Be a Dummy”. The songs are undoubtedly of a more commercial nature, but still offer a punch as highly effective rock with a slight retro edge. Being featured in a jeans commercial was probably as effective back then as it is today. The ending of this collection are the quite well-known “Don´t Lose Your Mind” and “They Took Control of You” from the return of ATOMIC ROOSTER in 1980. The band may have sounded slightly oddly retro but among the recognizable guitar, Hammond and vocal parts there is also traces of adapting to the new hard rock era. If you are not acquainted to the work of the late great JOHN DU CANN, this is one of the best introductions possible. R.I.P. JOHN!